This high power 1000W kit uses a front wheel direct drive motor and a rack battery. It has high discharge PANASONIC lithium ion cells to allow the high power draw of the motor and controller. It’s a great kit for a balance of high speed and range. You shouldn’t use this kit with suspension or carbon fibre forks, they’re not strong enough to safely withstand the motor torque, using a rear wheel kit is better in this situation. 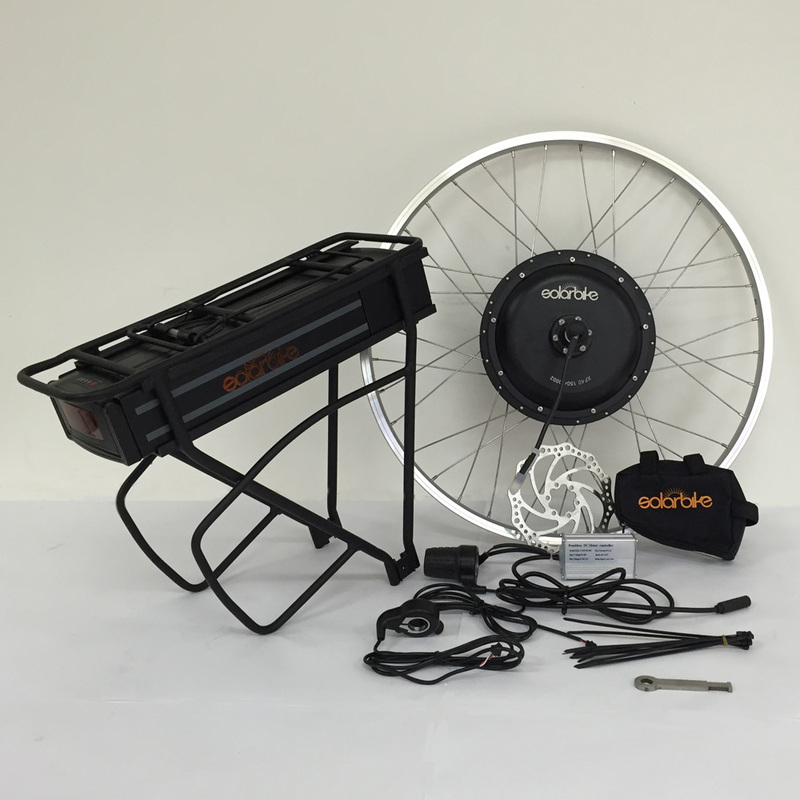 The kit includes a PANASONIC 48V 14Ah rack battery, 48V lithium ion battery charger, motor laced into ALEX DH18 rim with stainless steel spokes, motor, controller, twist grip throttle, thumb grip throttle, torque bar, cable ties, disc, inner tube and instruction manual. All kits are disc compatible and require a 48V battery. 200W is the legal limit for riding on the road. Information: Kit includes PANASONIC 48V 14Ah rack battery, 48V lithium ion battery charger, motor laced into ALEX DH18 rim with stainless steel spokes, motor, controller, twist grip throttle, thumb grip throttle, torque bar, cable ties, disc, inner tube and instruction manual. All kits are disc compatible and require a 48V battery. 200W is the legal limit for riding on the road.